The Tempest Mk II is a Rank IV British fighter with a battle rating of 6.3 (AB/SB) and 6.0 (RB). It has been in the game since the start of the Open Beta Test prior to Update 1.29. The main tactic for the Tempest II is high speed combat. With a weight of over 5,000 kg, and a peak WEP power of 2,500 HP it can accelerate very fast in a dive. This means that less altitude is traded for the same gain in speed compared to other props. The second main benefit from the extra weight is that the plane can hold the speed gained form a dive for a long time. 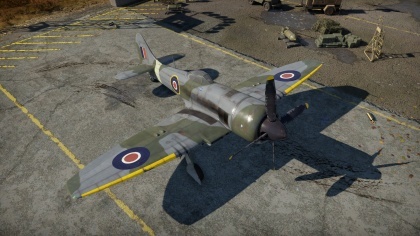 Additionally, the plane has a very sleek airframe, which means that it’s top speed is the highest of any prop in the game. Considering this data, the plane should be flown in high speed shallow maneuvers. Against jets the tactics are reversed. Jets are faster and heavier, thus shallow angles should be avoided. Steep angle energy fighting and turn fighting should be applied. Few exceptions against jets should be made. The Ho 229 will out turn the Tempest II, but upwards spirals at high speed are an effective way to burn away the 229’s energy and they are easily trapped. The second exception is the Meteor F Mk.3. This plane outperforms or is on par in every aspect except for, hilariously enough, top speed on the deck. The third and last are the Yak-15/17. They turn better, but their diving speed is a lot lower than the Tempest II’s. 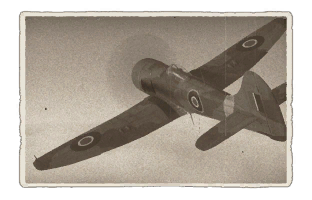 The creation of this plane also came with it's older counterpart, the Tempest Mk V. The Mk II has a different engine than the Mk V which is why they seem different. The Mk II's were use later in the war than the Mk V's. This page was last edited on 6 December 2018, at 11:53.